Shirts With Random Triangles: Danai Gurira ("The Walking Dead's" Michonne) To Play Afeni Shakur In Tupac Shakur Biopic "All Eyez On Me." Danai Gurira ("The Walking Dead's" Michonne) To Play Afeni Shakur In Tupac Shakur Biopic "All Eyez On Me." 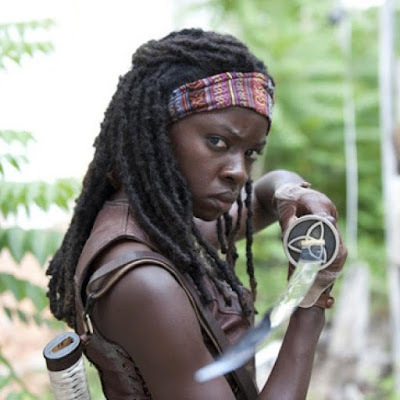 Danai Gurira as Michonne in The Walking Dead. Img. via the-walkingdead.com. Danai Gurira will be switching from playing a character who fights zombies who won't stay dead for playing the mother of a rapper who's may or may not be dead. The actress who play's the Walking Dead's Michonne has been cast in the Tupac Shakur biopic All Eyez On Me as the late (or is he?) rapper's mother, Afeni Shakur. The film, which recently began production in Atlanta, Ga. , is being directed by Benny Boom (Next Day Air). Tupac will be played by Demetririus Shipp Jr. , a relative unknown with a striking resemblance to the rapper. Jamal Woolard, who played rapper Biggie Smalls (a.k.a. Notorious B.I.G.) in Notorious, will reprise the role for this biopic. Tupac and Biggie were involved in a feud that was part of a bigger rivalry between East Coast (Big Boy Records) and West Coast rappers (Death Row Rappers) that exploded in the mid 1990s. Tupac was shot and killed in Las Vegas in 1996. Biggie was killed in a drive-by incident in Las Angeles six months later in 1997. Both murders remain unsolved.